In recent years we’ve seen a notable reduction in the growth of Medicare spending compared to prior decades, both overall and per beneficiary. This reduction can be partially attributed to policy changes, such as adoption of new healthcare reimbursement models (aka pay-for-performance reimbursement models). These models, created as part of the Affordable Care Act, seek to reduce costs by encouraging providers to share responsibility for providing coordinated care that limits unnecessary spending. Patients benefit from receiving high-quality, coordinated care, and providers through Medicare incentive payments. If you’re wondering how these new models work, we’re here to help (note these are simplified explanations). Fee-for-Service (FFS): FFS is exactly what it sounds like: every time a patient visits the doctor for a physical, blood test, CT scan, etc. ; the patient (and the insurer) pay separately for the services they receive. Over the course of a long treatment or chronic condition, those costs add up. After all, the more services doctors provide, the more they get paid. This often results in uncoordinated care, duplication of services, and fragmentation. Accountable Care Organizations (ACOs) are groups of providers across different settings – primary care, specialty care, hospitals, clinics, etc – who voluntarily come together to share responsibility for cost, quality, and outcomes for a large patient population. By bringing providers together under the ACO umbrella, patients will ideally receive more coordinated care with an increased focus on prevention and keeping patients healthy. It can also reduce costs associated with redundant tests and overlapping care. ACO Analysis & Operational Support: Assist with measures selection & specifications; provide technical assistance, & audit quality data. Pioneer ACO: Assist with design & development of a quality reporting tool that supports the model. A bundled healthcare payment model estimates the total cost of all services a patient will receive over a defined period of time for a certain problem, like a knee replacement or heart surgery. For example, if a patient undergoes heart surgery, payers would traditionally reimburse the hospital, surgeon, and anesthesiologist separately for the care they provided. Under a bundled payment model, the payer reimburses all providers with a set price for the episode of care. This encourages the provider (in collaboration with the entire care team) to better manage the patients’ care by avoiding preventable complications, like a hospital readmission. Bundled Payment Care Initiative: Subject-matter expertise related to collection & analysis of qualitative & quantitative data. Comprehensive Care for Joint Replacement: Evaluate the model through primary data collection & operational support, data analysis, & reporting. 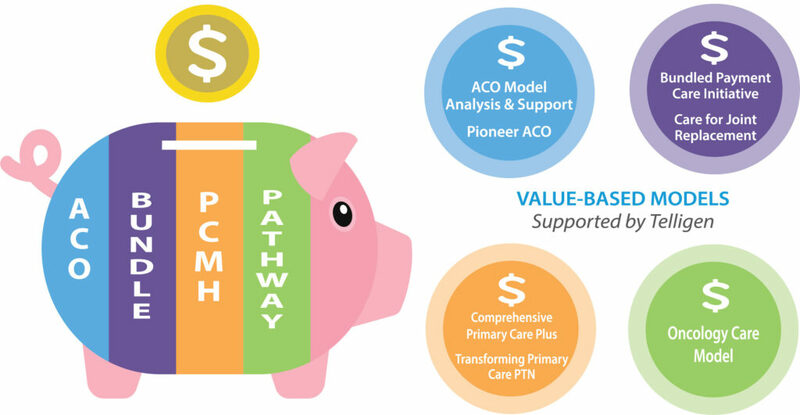 PCMH models differ from other models in that they provide set monthly payments on top of existing funding models (such as FFS or an ACO) to fund a coordinated care team which may include (depending on patient need) specialty physicians, nutritionists, psychologists, and community-based services. Monthly PCMH reimbursements can be used to provide additional care to high-risk patients (such as telemedicine or home visits) with the goals of reducing emergency room visits and preventable problems. Comprehensive Primary Care Plus: Provide comprehensive primary care support services and subject-matter expertise to participating practices & payers. Transforming Primary Care Practice Transform Network: Support initiatives working to achieve large-scale practice transformation in Iowa, Illinois, & Colorado. Popular in oncology care, pathways models of care are evidence-based decision-making tools that help oncologists and individual patients pick the most appropriate course of treatment. For example, consider the choice between two cancer drugs proven to have the same effectiveness, with no difference in side effects – one just happens to cost less than the other. Using pathway tools makes the provider more likely to select the less expensive of the two equally effective treatments. Oncology Care Model: Centralized provider support related to quality measures, feedback reports, site visits & monitor claims data.